The project on the Kaiser-Franz-Josefs-Höhe bears the title Alpenliebe. It also bears the signature of Hubert von Goisern, who has curated a listening experience for the exhibition with more than an hour of music and sounds from across the alpine region - from France to the Vienna Woods. Together with a broad spectrum of contemporary art from around 20 artists this multifaceted listening experience, Steilklänge, marks the 150th birthday of Richard Strauss and will be officially opened on 11th June 2014. 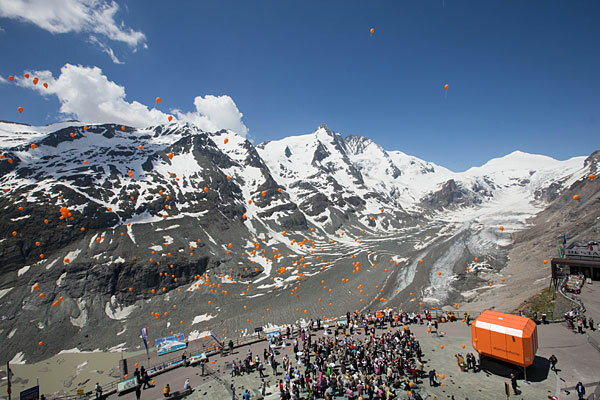 The permanent exhibition will then be open to the public from the 12th June 2014 at the Kaiser-Franz-Josefs-Höhe visitors' centre on the Großglockner High Alpine Road. Traditions, musical ones in particular, are sources of inspiration, friction and monuments of agreement. Or they can be the opposite: demarcation and exclusion. When Hubert von Goisern was asked to curate a selection of music from across the Alps for an exhibition on Franz-Josefs-Höhe on the Grossglockner High Alpine Pass, it was a welcome opportunity to once more take a close look at the musical heritage of alpine culture. Not just at the roots, which reach through the generations, far into the past, but also its branches, which enrich the present and the fruits, which have made their way around the world. Hubert von Goisern is no folk song researcher, nor music ethnologist, in as much as there is no underlying methodology in this compilation. But just as the mountains must first be made accessible to be explored on foot, you must take time for the unostentatious music of their inhabitants and fall quiet yourself; and perhaps be led or even misled by someone else. Steilklänge lays the foundation. A trip into the Alps without walking shoes, climbing or exertion, that is Steilklänge. This album combines bizarre, mysterious folk music from across the entire alpine region: singing from Piemont, music from the Résia valley, Swiss "Zäuerli" and more, brought together by Hubert von Goisern, who went on a musical journey to find the heart, the essence of folk music. It all began with the request for Goisern to put together the music selection for the Alpenliebe exhibition on Großglockner. He of course said yes, thinking that it would be a walk in the park for him. And then he found "that suddenly there were more blank, white areas on the map than there were areas where I knew what was played," said von Goisern. But there were even more surprises when von Goisern came to unknown regions, meeting interesting people there and discovering "very old, very touching, genuine folk music": Goisern came across the most varied yodels, sacral singing, violin pieces, gstanzl, zither music and many more unmistakeable and unique elements. He wants to make these impressions audible for everyone with Steilklänge. Or at least, a small proportion of them: the CD is only a small excerpt of what Goisern experienced, "like flying over a landscape in an aeroplane and from time to time the clouds part and you can see through." Fingers chirp across guitar strings, or pluck the zither. The Turkish crescent plays with the chirruping flute and lilting accordion as if celebrating the most wonderful fairground of all time. A voice yodels completely alone out into the world, tenderly entreating the cattle to come home (herdsmen know that their calls work). A man sings in a round, where one knows and laughs approvingly that it is the melody of Horst-Wessel-Liedes Die Fahne hoch with completely different lyrics, including: "The brown pest oppressed people, / the brown pest murdered people. / They adorned themselves proudly with victory flags, / Until the Allies threw them in jail." The pointed hum of a mosquito in flight and the thud of its final end are produced with comical onomatopoeia from the sound box of a Jew's harp. A yodel duo in a song about a dratted marksman on the Zitteralm reveals with full-throated joy that the poacher was not discovered. An antiphonal Sancta Maria resounds in a church hall. And one hears for oneself what a "Kampl dixie" is and how one can do it with unaccompanied "Didittdittdie-didittdittdie" singing and finger clicking. For all this is to be experienced on a new CD. 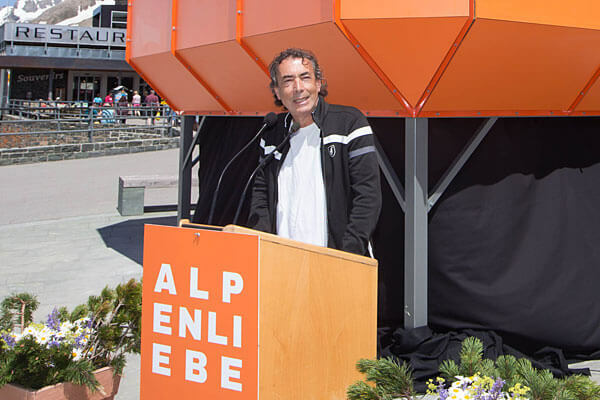 It is a fortunate "by-product": Hubert von Goisern contributed the acoustic part, music and samples from the alpine region, to the Alpenliebe exhibition on Großglockner, which opened in June 2014. Not just from Austria, Germany and Switzerland, but Slovenia, France and Italy too. Hubert Achleitner, as the musical multi-talent from the Upper Austrian town of Bad Goisern, is really called, is no music ethnologist, he chose according to his own taste. And his own taste is trained in such a way that the otherwise in itself not unwarranted suspicion that "reactionary folk", should be revived, or kept alive, comes to nothing. He doesn't go over the top, but the inheritance of a culture deeply rooted in people is lifted up. 99 tracks were chosen and even for Goisern, as someone who knows about alpine folk music, there were lots of discoveries. Many, where, as he says, he had no idea that there was still such a thing in Central Europe. "Very archaic, very old and very touching, really proper folk music." The fact that, for example, whole villages in Northern Italy sing together, "it gives me goosebumps just talking and thinking about it", von Goisern confesses, and when you listen to the music, you feel just the same. "I feel quite light and strange." At the moment, the Großglockner Hochalpenstraße is unfortunately shut for the winter, until the beginning of May. But fortunately: of the three and a half hours of songs and instrumentals that von Goisern compiled for the exhibition, 70 minutes can be heard on the CD Steilklänge, 28 tracks, from bell peals in the Austrian Pitztal, to his own Juchitzer (Wia die Zeit vergeht). It took many musical detours before Hubert von Goisern returned where he belongs - back home. And home to the sometimes rustic, sometimes introverted Austrian is the spa town of Bad Goisern (! ), idyllically situated in the Salzkammergut and at the food of the Dachstein glacier. It's logical that folk music is ubiquitous in such a place. But since lateral thinkers such as Konrad Deubler, one-time mayor and philosopher, writer Franz Kain emerged from this place, it became clear to this guy, who sees himself following in their tradition, that he wouldn't be playing reactionary folk music, but instead would provide a new and innovative approach to it. After a number of journeys to exotic countries, Hubert Achleitner, as von Goisern is called in civilian life, founded the Alpinkatzen formation at the end of the 1980s, establishing it in six years as a legendary institution in the broad realm of folk-ethno-schlager-pop music. Yodelling in a completely new style played a role here too, as did the use of unusual instruments such as the wooden flute or Jew's harp, and lyrics in unwieldy Austrian dialect. Hubert von Goisern & Die Alpinkatzen became a kind of living legend - but when they were at their most successful, the group was disbanded and their founder went travelling again. Von Goisern worked as an actor, soundtrack composer and produced two idiosyncratic productions developed in Africa and Tibet. Not until 2000 did the musician from the Salzkammergut return to his folk music roots with his much-celebrated masterpiece Fön. The fact that Hubert von Goisern can rely on his loyal fans is also down to his stubbornness. He always insisted on making folk music, even though this term has a lousy reputation with younger people and intellectuals. But von Goisern's folk music is far from the folksiness and kitsch of Florian Silbereisen's Saturday evening programmes and the like. In the last two years von Goisern has delved even deeper into the cosmos of folk music in its modern form. 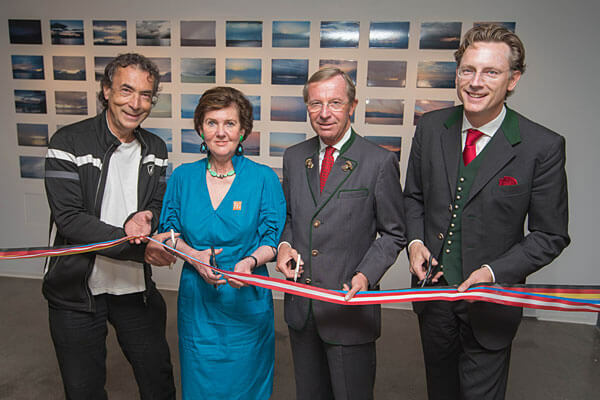 Firstly he curated the music concept for the Alpenliebe exhibition on Großglockner. Extracts of this programme have been released under the title Steilklänge – a collection of atmospheric-sounding music snippets, dedicated to the world-famous mountain massif. Secondly the Upper Austrian worked with the 83-year-old Viennese cult arranger and conductor Robert Opratko to create the soundtrack with the name Filmmusik for director Joseph Vilsmaier's new documentary film Österreich - oben und unten. Von Goisern classics are to be heard, recorded by a large orchestra. "And next year", says von Goisern, "there are further exciting projects. There's a new studio album and a film about my work. And I'm already looking forward to the new tour. I can't help but keep going." Two years away from the stage are a long time for a musician. Time to recuperate from the strains of constantly being on the road. And when the tourplan gets longer and longer, management starts worrying too, whether the artist is going to keep up the enthusiasm it needs to play for the public evening after evening. Austrian Hubert von Goisern disabuses his closest advisers of this notion: full of energy and get-up-and-go he's going onto the next tour, which stretches into next year - and it started a while ago! But what has he been up to in the two year break? Gregor Praml lets us know. He actually asked for a break from the stresses and strains of the last tour. But he hasn't really sat still. Hubert von Goisern is an alpine musician from the Salzkammergut, who exudes the calmness of the mountains and their inhabitants in his voice and manner. But clearly things are brewing inside him. He is a driven explorer, constantly in search of something: exchange with people, the next inspiration. During the two years in which he was not on tour, he made the film Brenna tuats schon lang and wrote the music for a new album with his band. He'll be releasing both next year. But that's not enough: he has prepared two other music projects and that's what this is about. On the one hand there's the music for the documentary Österreich - oben und unten from Joseph Vilsmaier and on the other hand there is the CD Steilklänge, with which we will begin. The Großglockner High Alpine Pass is one of the most popular attractions in Austria. Those who make it to the end of the 48km journey reach the foot of the mountain at Kaiser-Franz-Josefs-Höhe, where the Alpenliebe exhibition has stood since June. Hubert von Goisern was asked by curator Julia Stoff to put together a selection of music from across the alpine region. A point of honour for a connoisseur such as von Goisern. "I was surprised myself at how much time I invested in it. I thought at first that I'd do it blindfolded, since I know a bit about it and then, yeah, ... France, Italy, that's a blind spot, but Germany, Austria, Switzerland I know about. And of course right at the start it occurred to me: oh God, Slovenia, Slovenia, there's that too - they're part of the alpine region", says von Goisern. The work was intensive. So intensive that Hubert von Goisern even had to delay the release of his new band album until next year. But for the listener it is a wonderful journey through the Alps. Von Goisern compiled three and a half hours of music. For the album it's 70 minutes. Hubert von Goisern: "I travelled around a lot, I went to northern Italy and to the far west of Austria, I met a lot of exciting people, learned a lot where I didn't even have a clue that such things even existed in Central Europe. Very archaic, very old, very touching, really proper folk music." That can be heard on Steilklänge too. Music that sounds like techno. 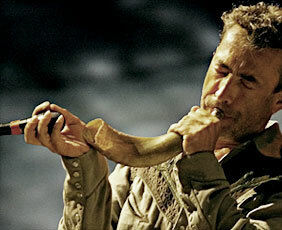 But performed on a Jews' harp, played by Anton Bruhin. Hubert von Goisern discovered him on his search too. For von Goisern it's about communicating the musical alpine region to the listeners as a whole - from yesterday to today. The same way that he surprised himself, he will also surprise all those who engage with the Steilklänge project and take a virtual flight across the Alps for an hour. One can only make progress through the Alps on foot very slowly. The lazier hikers can be quickly carried to the uppermost heights in cable cars, though the perception of details diminishes as a result. The album Steilklänge (Blanko Musik, release: Friday, 31st October) combines the possibilities of alpine experience with the home living room. Hubert von Goisern has made a musical compilation of the alpine region and made possible an imaginary walk through the 1200km region, in which both cultural history and regional differences can be experienced. At first Hubert von Goisern only shows himself indirectly with the the Kuahmelcher Jodler from his hometown of Goisern, performed by the Goiserer Viergesang; but he doesn't miss the opportunity of adding Juchitzer from his live album Wia die Zeit vergeht at the end of this album, which works more as mental cinema than easy listening musical pleasure. How fitting for a CD that is beautifully capable of resolving both the local constraints that are so difficult to overcome, as well as the constant advancement of time. 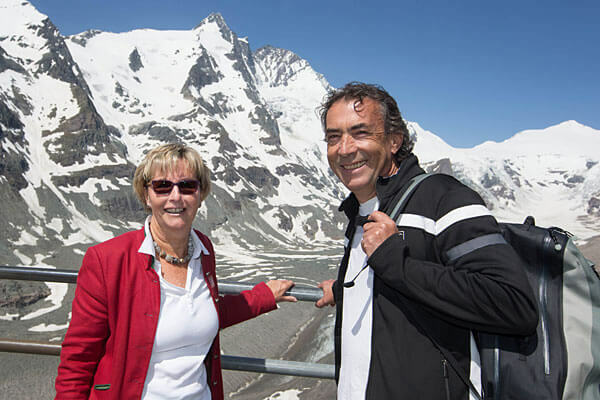 Hubert von Goisern talks about his affection for the mountains, our lives in the hamster wheel and his musical search for clues in the alpine region. Self-determined breaks are in his nature. In December 2012 Hubert von Goisern retired from the stage once more after the final concert of the brilliant Brenna tuat's tour. He has not been inactive since though. 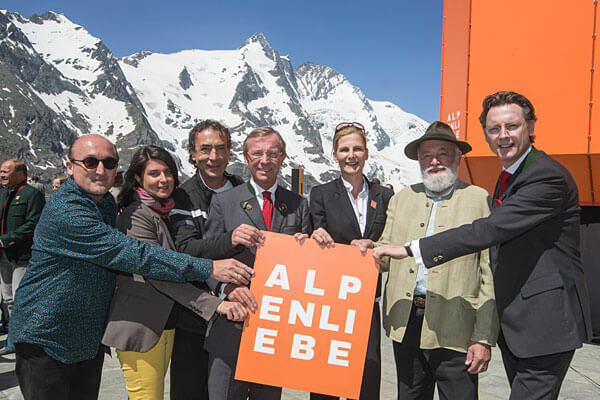 Under the title Steilklänge (Steep Sounds) he has brought together 99 songs from the alpine region for the recently opened exhibition, Alpenliebe, in the Kaiser-Franz-Josefs-Höhe visitors' centre. 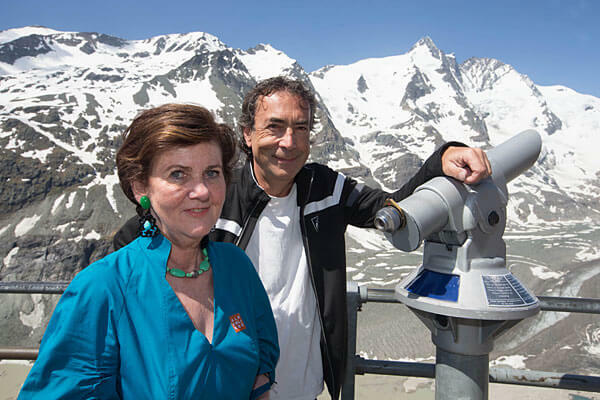 At 2369m above sea level, with the Großglockner peak in view, the OÖNachrichten spoke to the 61 year old musician. What do you understand by "Alpenliebe", "alpine love"? Love is an intimate and almost holy word. I prefer to go into the mountains alone, but of course there are so many of us now that being alone even in the mountains has become the greatest art. You need to be on very steep ground. It doesn't have to be called love, but doesn't a tender relationship develop in the mountains? Certainly a very respectful and one of the great affections. I have no idea whether I can give the mountains anything. Perhaps I contribute a little to people being careful with nature and with the gift that there are still such open spaces that have not yet been conquered by civilisation and machines. But I gain a great deal. For example, self-confidence and composure in the sense of being able to let go. You go up the mountains, the problems are then far below, you leave them in the valley, you sweat them out in walking. The fact that animals live in the apparently life-endangering natural world wrests me of modesty and humility. Words such as composure, attentiveness and slowing down are vocabulary suddenly present with many people. What does that signal? The world slowing down can't be talked away, it's simply happening. I think it's this hamster wheel in which we live. It's very difficult to opt out, because the societal pressure is there through advertising, politics and the economy, saying that everything needs to be cranked up, there must always be a boom, we have to struggle to keep it all going. It's led to us racing through our lives at a crazy speed. They're not fashionable words, instead they're very apt in our time. It's coming through pretty slowly that we need a counterbalance to this race through life. In order just to hold out, we need our anchor of calm, in order to come to reflection again and not have to be going along as if we're in a trance. Being at maximum capacity is only possible for very few people and the rest - I get the feeling - are almost ashamed that they can't cycle up Großglockner. It's all become so immoderate, because the bar is set so ridiculously high everywhere. Nobody knows where it's going to end. But the moment it ends, it's over. So that's why this slowing down is not a bad thing basically speaking, because it's pushing the end further away. Is is a paradox that people from the town are rushing to the country and in the valleys, the boys in particular, are making sure that they go to the town? It's a natural movement that has always existed. It's the countryside that preserves and nourishes the town. It's the countryside that allows something like a community to develop - although people live closer together , they are less connected to each other. It takes an accident for it to come a sense of unity. The townsfolk's longing to find the countryside time and again, in order to feel their roots there, is just as natural as it is that the young people have to go to the towns to get new life, new impulse. On your search for the Steilklänge project, did you find that isolation is a prerequisite for people playing and singing more together? Not at all. Greenland comes to mind, where I've been a couple of times. There's barely anywhere where people sing less and have so little time for music, and where it's really lonely. In Greenland they sing to dispel fear , because spirits come in silent. The playing and singing together is a rhythmic coming together that produces a wonderful feeling of unity. What surprises were there for you on your alpine sound search? That there isn't much in the French alpine region. The culture there has been concreted over. The singing from the Italian Alps was exciting, because there's a kind of singing out there that we don't have here. They open their mouths and simply release their voices. Our choirs foster fine singing. Lips are pursed and sounds are caressed with the tongue, which has something unnatural, contrived about it. The other surprise for me was the unbelievable variety in the Salzburg, Upper Austrian and Styrian borderland - around the Dachstein -, in comparison to the other alpine regions. I always took this variety and earthiness as a matter of course. Another discovery for me was also the singing around the Schneeberg. Is there something unique in your homeland that you haven't found anywhere else in the alpine region? I don't want to single something out, because I was looking for and finding these unique things everywhere. But the singing culture from the Salzkammergut, the solemnity of the yodels and the unsubduedness and wildness of the duple time country dances or schleuniger with the "Pasch". But there's no need to talk up anything like this. The earthier and more archaic it is, often the more tightly wound are the people. That's why I often have a harder time with them - and they with me. The term "authentic" has become a non-word for me now. Those who retreat to, or behind, the authentic are then orchestrating themselves and thereby rescind their authenticity. Is it also the tightly wound ones that say to you, we're not collaborating on a Steilklänge CD project? Yes, that's right - but there was only one case. That they're either worried that their authenticity will be lost in the face of the variety of alpine authenticity, or that their chauvinists. The show: For the "Alpenliebe" exhibition on Franz-Josefs-Höhe on the Großglockner High Alpine Pass, Hubert von Goisern scoured the alpine region and collected 99 pieces of music, from the "Schleuniger" of the Ischler Seitlpfeifer to the song "Die Nazibruat" from the Passeier Valley. The tour: The Goiserer starts his tour on the 20th October in Bad Ischl's Lehártheater, and on 16th November will also be at the Linz Posthof, which is celebrating its 30th anniversary. open from 11th June 2014 on the Kaiser-Franz-Josefs-Höhe, Großglockner High Alpine Pass. 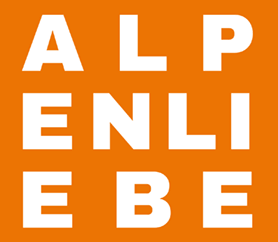 Martin Heller: You have put together a selection of music from across the alpine region for Alpenliebe. What moved you in the process? Hubert von Goisern: Twenty years ago I listened to a great deal of Austrian folk music. It interested me, but at some point I thought that I pretty much knew it all. The invitation from Julia Stoff gave me the opportunity to do new research. What I found along the way is astounding. The Schneeberg yodel for example. There's a yodelling culture in the easternmost foothills of the Alps, which I never would have expected so far from the inner alpine region. They really sound like the ones you know from the deepest valleys in the Salzkammergut, or in Pongau, or even better. The songs from Premana, above Lake Como. Whole villages there have a singing culture that I thought might still be found in the Third World, but not here. They sing all through the night. And the Alps themselves are a bit of the Third World. A lot there is still completely isolated and exclusive, as well as exclusionary. Even if you only live twenty kilometres further away - you don't belong. The discovery that there was as good as nothing to be found in the French Alps in terms of traditional music. They don't sing and play music? The few villages there were are as good as culturally extinct, they're just fortresses of tourism now, without a specific culture. Just barely though, I found two beautiful violin pieces from the region. But astonishingly: I thought I'd get to know something completely new again, but it wasn't the case. Can your interest be described? Where do you start? It has to be something special. I'm not looking for the common denominator either. I'm looking for prototypes of this music, their core, from which things have later developed - the unchangeable, the unique. Does this core have anything to do with the age of the tradition? Or more with the artistic personalities who produced these especially vital interpretations? Either is possible and important. There are unique musicians and ensembles. Among them are personalities such as Ernst Krenek, who was from Vienna and travelled the Alps, taking unbelievable inspiration from them for his songs. Or Olivier Messiaen, who in many of his works dealt with the "abysses", as well as the "clearances" that he had before him during his childhood in Grenoble. At the same time there are phenomenons like the Italian villages I mentioned, or the Kuhreihen melodies from Switzerland, the Ranz Des Vaches, with their Austrian equivalent, the Küahsuchern, which have been preserved for hundreds of years. Therein also arose a great pull for classical music, which you have also included here and there. Sure. The examination of folk music forms and motifs is closer to me than Richard Strauss, whose Alpensinfonie is an ultimate illustration of a mountain experience. In the third section of Rossini's overture to William Tell for example, there's a Kuhreihen, and in the first phrase of Alban Berg's violin concert, there's a Carinthian folk song. Despite all the differences in your selection, can you explain to someone what the common denominator is in music from the alpine region? To a musician, or a non-musician? I could refer a musician to the first and fifth degree: that's the occidental cadence, on which everything is built. I've no idea whether it developed here, or whether someone brought it from One Thousand and One Nights. This cadence is typical of the alpine, everything is in it. Added to that is the fact that the melodies are often built on the triad; there are few scales, it's more this triad. And if someone doesn't have any knowledge of musical theory? You need to work with comparisons. Take the music from the Sardinian mountains: they have diatonic button accordions like us with only two rows and play similarly, but yet differently - much more nervously, with many more tones. The alpine has a greater calmness. You make a tone and let it take effect. It pervades. The instruments that do this differ though. In Bavaria it's the zither, along with the accordion, that makes the sound that pervades from the Allgäu to Upper Bavaria. In turn the alphorn belongs mainly to Switzerland. Instruments have turned up quite late anyway; people had no time or money for it before, life was too hard. The first instrument was and is the voice, everyone has it and so the singing culture is distinctive. An old Swiss dance melody from Max Lässer is significantly called Nume nid gschprängt, something like We won't be hurried. Is this typically alpine? Yes. But I find this resistance with the Samis and the Tuaregs too, or the North American Indians. There's music to really get going to as well, but likewise, on the whole people are fairly checked. Life among extreme nature makes it that way. You can't just stumble along in the mountains, or you'll fall down somewhere - and that shapes you. Some examples return audibly to sacral sounds. A lot naturally is connected to Christian, Catholic traditions, with processions and celebrations. In Austria or in Switzerland it's not as distinct as in Italy though. Such as in Lamento, this impressive lamentation of the dead? Yes, that comes from a tiny German-speaking minority northeast of Lake Garda. Everyone all around speaks Italian and if you're not paying attention, you don't realise that it's German. Was it difficult to find such evidence? It wasn't always easy, because some "specialists" refused to share their knowledge, or were even of the opinion that I should buy it from them. I thought that was extremely strange. After all, it's not something they've produced or created themselves, but rather knowledge that benefits the artists and above all the culture. But I was fortunate enough to meet a few people, musicians particularly, who have been working on the subject intensively for a long time and who took pleasure in helping me. Can you see a reason for this reservation? Perhaps many of them though, here comes Hubert again, wanting to tap into a source and make something from it that I won't even like at all. It's to do with the fact that people who identify with a special culture like to stick together. Many have the feeling that they're standing with their backs up against the wall. They don't want someone singing a note in their music that wasn't there before. Is the material you were looking for normally already available and on CD? The field has already been well-researched. However there are special collections too, for example in the Folk Music Society's archive. There's a lot of material from the Nazi time too, because back then they wanted to record such cultural material particularly well and comprehensively. Was that a reason why you included the Nazi-Brut? Yes, it belongs in there. The town folk so often portray the mountain folk as the core of Nazidom. But here too there was and is both. As a musician you've been looking for a long time at lived tradition. Has your view changed with the development of your own musical interests? No, I don't think so. It's as if I've picked up the thread that I put down twenty years ago. Back then I thought that you couldn't and didn't need to know everything. There need to be chances, with the help of which you suddenly discover something new. Now I had cause to give chance another kick. There are many people who, like you, are trying to drive on tradition. Yes, Max Lässer and Stimmhorn for example, then Palindrone or Federspiel, who operate under the term world music. I definitely wanted them in the selection, so that not just a geographic, but also a chronological span grew. Are there different approaches? I'm assuming not everyone comes from the mountains. Most of them do. Of course, not from Goisern or Lauterbrunnen any more, or all from the valley. There are people from different areas, who met in an urban setting. There they found a mutual love of their roots, into which a modern lust for life and modern habits could flow. Is there an example where this collaboration of tradition and urbanity is at its most meaningful? The first one I think of comes from Goisern ... but Hotel Palindrone is also very, very exciting. Or when you notice in a yodel from Broadlahn that the African and Pygmaen yodelling traditions are connected to the alpine. I've only selected examples that work; there are lots of others though. Mélanges where you think, that has no substance, or the worlds disrupt each other and you think: what a load of crap. Exactly. People simply take and play another rhythm over the top, or add in a new sound. It's too little. The feeling of playing doesn't reach the core, instead moving around the edge and the surface. Is there also a burden of tradition? Can it sometime paralyse people? Do you concern yourself with the question of respect at all? In the beginning I didn't care. I even lined up to deconstruct it. I wasn't shy about breaking something or banging heads with someone. It changed later. In particular when after the Alpinkatzen I occupied myself with Tibetan music, or African. I found there was a taboo zone. I can do what I want with my own music. But with music in which I am not rooted, I get a guilty conscience when I do something different and don't know how it will go down with the people who have it deep inside them. Whether it will release positive or negative feelings when they suddenly hear their music in a changed form. Nowadays I believe that the change of tradition can only be done by those who live it. This dealing with tradition is probably easier today, because listening in to different universes has become more natural. Certainly - at least more natural than twenty, thirty years ago. But more difficult too, because the sources are beginning to run dry. Folk music used to be omnipresent. Salzburg regional radio played folk music what felt like 24 hours a day. Nowadays you have to search to find an hour where folk music is really played - the rest is pop or oldies, sung almost only in English. Or: it was the case that people would be playing in every other tavern, it was no problem to hear folk music live. Nowadays you've got to look for it. A certain freedom goes with it. You can avoid the scene. But now the supermarket or format radio forces the blessing of soapy vapidity upon us. Has the ideological discussion been resolved, in which folk music is seen as an erratic, conservative block and everyone who gets involved with it is immediately viewed with the same general suspicion? The suspicion of conservatism is and remains justified. Traditions are a priori encompassing as well as partly exclusionary. I think this "we are who we are" is still there. It's particularly unacceptable when people deduce a supremacy from it. Perhaps it will die out one day. But it doesn't have to be that way. [...] [Hubert von Goisern] has put together his very own musical programme from the Alpine countries under the title Steilklänge (Steep Sounds). The 99 music tracks accompany visitors on their way through the exhibition. 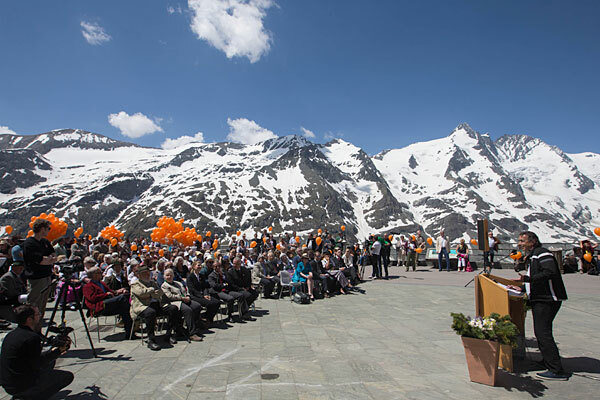 On the day of the opening, guests on Franz-Josef-Höhe waited in vain for a musical message from the world musician. "I wanted to play something. But I decided against it two months ago. The peak isn't acoustically conducive." Goisern found that out for himself a few days before the opening of the exhibition. He offered up a yodel and was promptly told by a German tourist: "Young man, you still need to practise." And so on Monday it was a verbal message. Tolerance was the subject. All too often the impression arises that things seen from afar appear familiar and close. But with increasing proximity, suddenly distance and alienation arises. That holds true in the mountains too. Someone moving from one valley to another often permanently remains a "Zuagroaster", an "outsider". 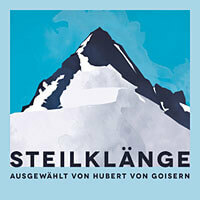 Austrian singer-songwriter and world musician Hubert von Goisern has put together his personal music programme from alpine countries for Alpenliebe with the title Steilklänge (Steep Sounds). Visitors can look forward to an acoustic journey through the musical traditions of this multi-ethnic region. The invitation from curator Julia Stoff gave Hubert von Goisern the opportunity to do new research; along the way he discovered amazing things. "The singing from Premana, for example, above Lake Como. Whole villages there have a singing culture that I thought might still be found in the Third World, but not here. They sing all night. And the Alps themselves are a bit of the Third World. A lot there is still completely isolated and exclusive, as well as exclusionary", says Hubert von Goisern. that he doesn't know as much of his own alpine music tradition as he thought. SALZBURG. Hubert von Goisern was mistaken. He often plunges deep into the tradition of his homeland with his songs. He thought. And that he, the most successful renovator, the adjuster and plougher of this alpine music culture, "knew more or less everything" of his own tradition. But now he has found yodels in the East Alps and songs at Lake Como that have amazed him. 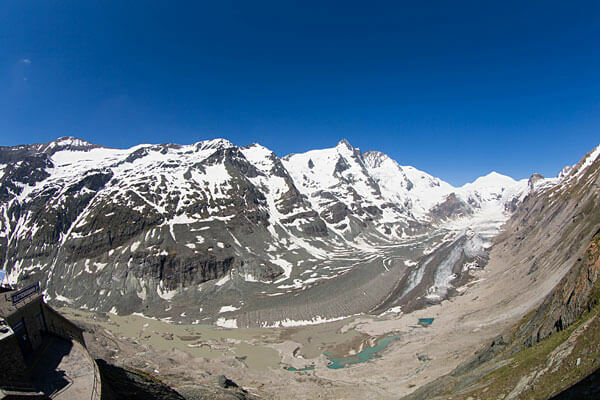 The opportunity for this insight came from Austria's highest point: the Großglockner. Hubert von Goisern is curating the music programme for the Alpenliebe exhibition, which is opening this week on Franz-Josefs-Höhe. For it, he went on a treasure hunt. He returned to his original mountain musical cosmos, the folk music of the Alps that shaped him, which sounds within him, which he adapted for himself and on which he has time and again turned his back. For the exhibition he found gems that form an arc over not just the alpine ridge, but from history to the present day too - from the narrow, archaic sound of the valleys, to the broad sounds freshened up by urbanity. "It's as if I was picking up a thread that I had dropped years before," he says. On his search he still met with the mistrust that he knows from the beginning of his career. Some "specialists" had even refused to pass on their knowledge. "Many were even of the opinion that I should pay them for it." Generally though, the dealings with tradition "have become more natural than they were 20, 30 years ago." Finding it is more and more difficult though. "Folk music used to be omnipresent - in taverns and on regional radio broadcasts too." That doesn't exist any more. But something else remains: Goisern's current search could not refute the suspicion of conservatism. This suspicion remains "justified". "Traditions are a priori encompassing as well as partly exclusionary", he says. And he wasn't surprised that he found a singing culture in villages at Lake Como that reminded him of similar traditions in countries and villages in the Third World. The Alps are "themselves a piece of the Third World". "A lot there is still completely isolated and exclusive and exclusionary. Even when you only live twenty kilometres away - you don't belong. "It simply can't be accepted when "a supremacy" is deduced from it. Hubert von Goisern has moved between many places and through cultures where he, as a Goiserer, doesn't belong. The Ausseers beyond Pötschen Pass would probably claim that too. And especially the Ebenseers where the Traun exits the valley. On his journeys through the world he has always found it difficult to use foreign traditions for himself and his music. The experiences of his journeys then often flow in quite unconsciously He has dealt intensively with Tibetan and African music. When making his own thing from it, a "guilty conscience" always crept over him. The uncertainty was great as to how it would go down with people who "have this culture deep within them". It was easier with his own culture. He easily mixed world language with pop music. Respect for a tradition that has determined him too doesn't play much of a role. "In the beginning I didn't care. I lined up to deconstruct it." The view into the world has made one thing clear though: "I now believe that changes to tradition can only be made by people who live them." For the exhibition on Großglockner he searched between the Ötscher peak and the Maritime Alps "not for a common denominator, but for prototypes". He looked for a core of music, "from which things have later developed - something unmistakeable". He was amazed on his current search for the exhibition that he found himself in silence in the French Alps for example. "The few villages there were, are considered to be culturally extinct and are now only fortresses of tourism without any specific culture", he says. He then "just barely" rustled up a few beautiful violin pieces. The French Alps are therefore reflected in the classic work of Olivier Messiaen. Where he grapples with abysses or clearances in his compositions, his childhood in Grenoble, the largest city in the Alps, shimmers through clearly. Alpenliebe will be opened this coming Wednesday. 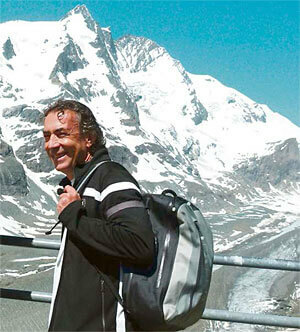 It is planned to release the alpine sounds brought together by Hubert von Goisern on CD.